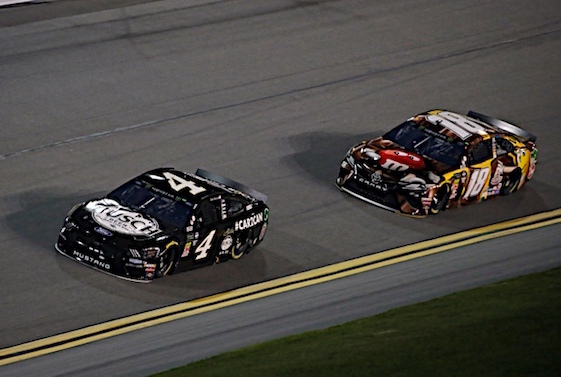 DAYTONA BEACH, Fla. – Ford Motorsports executives exhibited a tremendous amount of confidence in their new Mustang’s performance during the off-season despite rules changes in the Monster Energy NASCAR Cup Series after development of the car began. In Thursday’s Gander RV Duels, their new car didn’t disappoint. Ford dominated the 60-lap qualifying races for Sunday’s Daytona 500. Kevin Harvick won the first race, leading the final 44 laps in his Stewart-Haas Racing Ford. Joey Logano, with help from Team Penske teammate Ryan Blaney, shot from fourth to first on the final lap to defeat SHR Ford driver Clint Bowyer in the second duel. In both qualifying races, Ford claimed the first three positions. Matt DiBenedetto was Toyota’s top finisher in the first Duel, claiming fourth. Denny Hamlin carried the Toyota banner in the second Duel, also with a fourth-place finish. Chevrolet was led by Bubba Wallace in the first Duel and Kurt Busch in the second. Wallace finished sixth and Busch fifth in their respective races. The Hendrick Motorsports Chevrolets appeared to handle well, transitioning easily between the inside and outside lines. However, in the second Duel Chase Elliott couldn’t get anyone to draft with him and had to settle for eighth. Jimmie Johnson and William Byron appeared to have a similar issue in the first Duel. Johnson eventually finished eighth after getting into an incident with Kyle Busch on the backstretch that sent Busch spinning. Both had to pit for fresh tires. Daytona 500 pole-winner Byron finished 16th, the last car on the lead lap. It was Ford’s performance, however, that raised eyebrows. Unlike Chevrolet, which struggled through the first half of last year’s Cup season with its new Camaro, Ford apparently has avoided the pitfalls that the introduction of a new car can bring. Clint Bowyer, who led twice for 41 laps in the second Duel before settling for second, said he was happy with his Mustang. And if Ford’s Mustang maintains its strength, it could be a long, frustrating year for Chevrolet and Toyota. 1. (3) Joey Logano, Ford, 60. 2. (4) Clint Bowyer, Ford, 60. 3. (9) Aric Almirola, Ford, 60. 4. (6) Denny Hamlin, Toyota, 60. 5. (10) Kurt Busch, Chevrolet, 60. 6. (8) Ryan Blaney, Ford, 60. 7. (14) Jamie McMurray, Chevrolet, 60. 8. (2) Chase Elliott, Chevrolet, 60. 9. (5) Austin Dillon, Chevrolet, 60. 10. (17) Ty Dillon, Chevrolet, 60. 11. (11) David Ragan, Ford, 60. 12. (16) Kyle Larson, Chevrolet, 60. 13. (1) Alex Bowman, Chevrolet, 59. 14. (7) Erik Jones, Toyota, 59. 15. (15) Brendan Gaughan(i), Chevrolet, 59. 16. (19) Corey LaJoie, Ford, 59. 17. (13) Casey Mears, Chevrolet, 59. 18. (12) Michael McDowell, Ford, 58. 19. (18) Ross Chastain(i), Chevrolet, 57. 20. (21) Joey Gase(i), Toyota, 57. 21. (20) BJ McLeod(i), Chevrolet, 57. Average Speed of Race Winner: 193.133 mph. Time of Race: 0 Hrs, 46 Mins, 36 Secs. Margin of Victory: .126 Seconds. Caution Flags: 0 for laps. Lead Changes: 4 among 4 drivers. Lap Leaders: A. Bowman 1-11;C. Bowyer 12-13;*. Gaughan(i) 14-20;C. Bowyer 21-59;J. Logano 60. Leaders Summary (Driver, Times Lead, Laps Led): Clint Bowyer 2 times for 41 laps; Alex Bowman 1 time for 11 laps; * Brendan Gaughan(i) 1 time for 7 laps; Joey Logano 1 time for 1 lap. 1. (8) Kevin Harvick, Ford, 60. 2. (10) Ricky Stenhouse Jr., Ford, 60. 3. (6) Paul Menard, Ford, 60. 4. (16) Matt DiBenedetto, Toyota, 60. 5. (4) Martin Truex Jr., Toyota, 60. 6. (17) Bubba Wallace, Chevrolet, 60. 7. (12) Chris Buescher, Chevrolet, 60. 8. (2) Jimmie Johnson, Chevrolet, 60. 9. (13) Ryan Newman, Ford, 60. 10. (15) Ryan Preece #, Chevrolet, 60. 11. (11) Daniel Suarez, Ford, 60. 12. (19) Parker Kligerman(i), Toyota, 60. 13. (9) Tyler Reddick(i), Chevrolet, 60. 14. (14) Ryan Truex(i), Chevrolet, 60. 15. (20) Landon Cassill, Chevrolet, 60. 16. (1) William Byron, Chevrolet, 60. 17. (3) Daniel Hemric #, Chevrolet, 59. 18. (7) Kyle Busch, Toyota, 59. 19. (18) Matt Tifft #, Ford, 59. 20. (5) Brad Keselowski, Ford, 58. 21. (21) Cody Ware, Chevrolet, 58. Average Speed of Race Winner: 177.749 mph. Time of Race: 0 Hrs, 50 Mins, 38 Secs. Margin of Victory: .165 Seconds. Caution Flags: 1 for 3 laps. Lap Leaders: W. Byron 1-15;L. Cassill 16;K. Harvick 17-60. Leaders Summary (Driver, Times Lead, Laps Led): Kevin Harvick 1 time for 44 laps; William Byron 1 time for 15 laps; Landon Cassill 1 time for 1 lap.